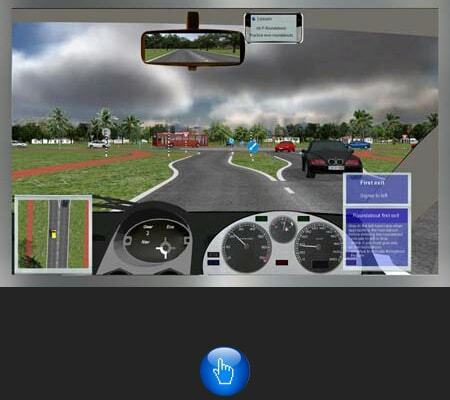 Carnetsoft develops professional low-cost driving simulator software for driver training and research. The software is installed on a desktop driving simulator. A desktop driving simulator has no cockpit (or vehicle cabin) with a driver seat. Instead, a steering wheel is attached to a table and the driver is seated in front of a four monitor setup behind the wheel. The driving simulator contains all the lessons your trainee needs to become a skilled and safe driver. The emphasis is on learning to drive safely. Not only vehicle control is learned and practiced, also safe traffic participation in different environments (urban, rural, highways, roundabouts, etc.) is a prominent part of the training program. In addition to a driving simulator for training, we have developed research simulator software for behavioural and human factors experiments, and applications for driver assessment and fitness to drive tests. We have driver training software for various countries and languages, both for LHD and RHD, so for countries where driving on the right lane is the rule and for countries where left lane driving is the rule. In each country-specific version, the road signs, markings and rules of the road for that country are applied. The virtual environments (sceneries) are adapted to the specific countries where they apply. There are versions for the US, UK, Australia, New Zealand, India, South Africa, Greece, Spain, Bulgaria, Romania, Italy, The Netherlands, Germany, Thailand, Malaysia, etc. Also for Arabic speaking countries, there are versions for KSA (Saudi Arabia) and Qatar. For more details, check the general driving simulator page. in a number of countries import regulations result in higher costs because of export documents. Click here to ask a question, order a car simulator or just the software. When you order the software module, an installation will be made with all virtual environments, road signs and rules of the road adapted to your country. The language of the virtual instructor will be English. You will receive an invoice, and the installation will be uploaded to the server within 2-3 weeks after payment, from where you can download the installation by the links you will receive then via email. After you have all the hardware ready, the software will be installed on your computer via TeamViewer. For that, your computer needs to be connected (only for the installation) to the internet. The regular driver training licence is for 3-channel rendering plus a monitor for the user interface. Three channel rendering means that there are 3 monitors for the rendering channels: one for the forward view, one for the left view and one for the right view. 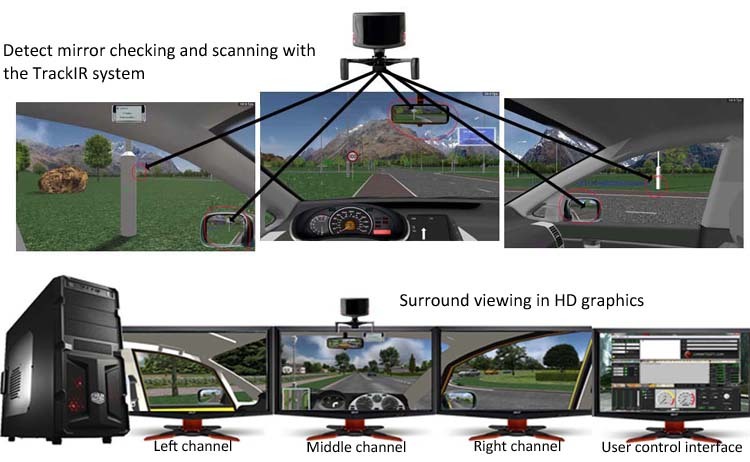 This gives a wide horizontal field of view (5760 x 1080 pixels) that allows students to look into sidesteets and inspect the right and left rearview mirrors. If you want to use just a single monitor and a computer with lower specs, there’s the lower cost single display driver training licence. Check the pricelist and specs to compare the two versions. The 3-DISPLAY system is recommended over the 1-DISPLAY system because is encourages better and more natural visual scanning behaviour. Click here for the support agreement. 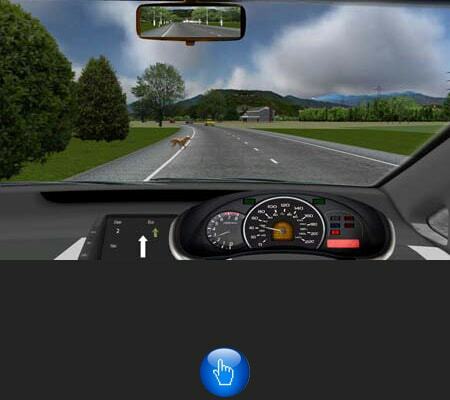 Description: Research driving simulator software for Human Factors research and to create experiments into car driving behaviour for use at Universities and research institutes. For price information, see here Description: Driver assessment car simulator software to evaluate clinical driver fitness, to treat driving phobia, assessment of driver skills such as brake reaction time, etc. What is a driving simulator? The term ”driving simulator” was originally used for machines with software developed to measure the behaviour of a car driver in a simulated environment. The first driving simulators were research simulators that were used in the car industry, to measure how people drive a car or respond to in-vehice devices, in research labs at Universities to study man-machine interactions and how drivers performed their tasks. More recently the term driving simulator is used more often for gaming software. This type of driving simulators, or car simulator, is used just for fun and is not really related to normal car driving. They are more like racing simulators, but even then the driving experience is aimed at increasing the fun factor and not to replicate real car driving, see for example the games Project Cars and Need for Speed. In these games, the players are not stimulated to be good drivers in the sense that they are encouraged to drive safely and according to the accepted traffic rules. So someone who performs well in such a ‘driving simulator’ game isn’t necessarily a good driver in a real car in the real world. In other words: the behaviour that is expected in the game does not match the behaviour in a real car in the real world. So, this type of software is not made to simulate real world driving and thus the term ”driving simulator” is not entirely correct in this case, although others use the term driving simulator for both fun machines as well as for training and research. You don’t become a good driver when using these games because you are basically learning all the wrong things, the task environment does not resemble real world driving, and because there’s no instructor who’s monitoring your behaviour and giving appropriate feedback. These games are made to impress by using state of the art graphics and bigger than life physics that are often incorrect. But they are a lot of fun to play, and that’s what they are made for. A lot of players don’t even use steering wheels or pedals to drive around. Real driving also requires the driver to look around because visual scanning is an important part of driving, but since most games use only one monitor, visual scanning is not a serious part of these so called driving simulator games. for assessment of driver fitness, where the task demands have to be similar to real world driving, and the driver performs a series of standard tests that are ecologically valid, reliable and the same for all subjects. This type of application can be referred to as a driver assessment simulator. for research into driving behaviour, man-machine interactions, driver safety, etc. These car simulators include functionality for data sampling, experiment construction and scenario creation, to make scientific research into car driving easier and safer. The term ‘research driving simulator’ is often referred to in this context. In driver training, it is important to practice a lot. Usually more than 40 or 50 hours of driving are required to become skilled enough for the first driving test. The extensive practice results in a level of task automation that results in better attention to unexpected situations and more efficient visual scanning. All this results in safer driving. Learning to drive on public roads, is very important, although it has some disadvantages that result in less effective task automation. Driving simulators can be of great help here, because the training curriculum in the driver training car simulator is specifically aimed at fast skill aquisition and task automation. – task automation: to become skilled in a task, such as car driving, extensive practice is important. Only when tasks are extensively trained task performance becomes automatic. Repetition of driving tasks, such as gear changing, lane changing, use of the indicator, approaching a junction, application of priority rules, negotiating roundabouts etc. makes sure the trainee practices all these tasks extensively, which results in task automation. This is where a driving simulator is particularly helpful. When essential tasks are performed automatically, they require much less conscious attention: the driver can focus and anticipate on unexpected events and divide attention to a wider view of the surroundings. This is the main factor that makes driving safer. A better skilled driver is more aware of hazards in the surroundings, looks further ahead, scans the surroundings of the car more frequently and checks the mirrors regularly. Situational awareness is of key importance for safer driving and in the driving simulator software. – visual scanning: the virtual instructor monitors the scanning behaviour of the trainee continuously, via a head tracker. 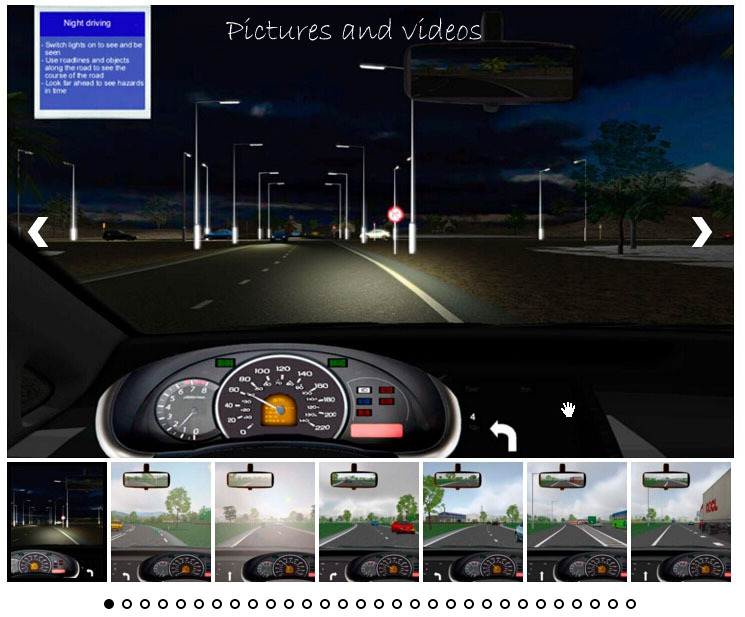 The driving simulator software evaluates whether the driver has checked the mirrors, and looks to the left and right when approaching an intersection, or checks the shoulders when changing lanes. Visual scanning is an important part of safe driving that must be integrated in the driving task and become second nature. Beginner drivers often lack the attentional resources to scan sufficiently which is one of the most important reasons why they fail their driving test. As drivers become more experienced, and the task requires fewer controlled and conscious attention because of task automation, more attention is allocated to visual scanning of the mirrors and the surroundings which results in safer driving. The driver training curriculum in the car simulator integrates visual scanning in the driver training from the start which is one of the reason why this type of training is so effective. Task automations and consistent evaluation and feedback on scanning and driving errors are things a car driving simulator is superior in, compared to the usual method of driver training in a learner car. Feedback is consistent, the virtual instructor in the car simulator checks consistently for driving errors. Quality of instruction and feedback is high for all students, and the reports, generated by the student assessment system are detailed and present a complete picture of progress of your trainees. The driver training software runs on a PC and includes 15 databases (highway, town, village, roundabouts, etc.) and 51 lessons. In addition, there are 13 simulations in different databases where the student can drive freely through a database. There are driving simulator versions for LHD (left-hand driving) on the right lane, as in the USA and continental Europe, and for RHD (right-hand driving) on the left lane, as in the UK and Ireland. 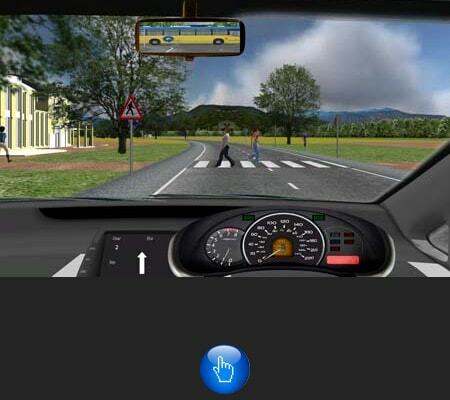 There are driving simulator versions with rules of the road and road signs for a large number of countries, such as the Netherlands, Germany, UK, Ireland, South Africa, Australia, New Zealand, India, Malaysia, etc. All lessons are in binary script and not modifiable by the user. All runtime software is in compiled form in C++ and python. 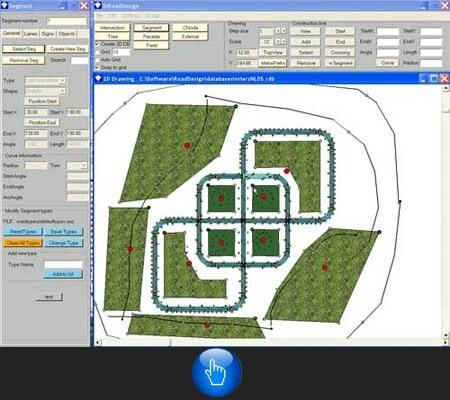 The software also includes the real-time rendering software, scenario- and traffic generation software and user interfacing. Results and progress is stored for each student individually in excel spreadsheets and contains predefined driving errors for a large number of driving tasks. For example, it is checked whether the trainee checks the mirrors regularly, maintains a proper speed, given the local speed limits and road signs, adheres to the priority rules, uses the indicator properly, maintains a safe headway to the vehicle in front, and many more. Verbal feedback is provided immediately by the Virtual Instructor, while results are stored in the Student Assessment System. The high quality driver training software gives your student the best driver training, for a very affordable price. The car simulator driver training curriculum consists of lessons that range from elementary vehicle control to complex traffic interactions and learning the rules of the road in a realistic setting. Also safety awareness and hazard perception (impaired driving and distracted driving) are important aspects of the car simulator training curriculum. driving in town and villages with traffic lights, pedestrians and zebra crossings, speed bumps, etc. Automation of driving tasks by extensive practice of, for example, driving on mini roundabouts or approaching and turning left or right at intersections, etc. And all this for a fraction of the price of other manufacturers of driving simulators. Information in Dutch (rijsimulator) can be found on a separate page. The scenario generation software allows you to create a route in a Virtual Environment, to define the behaviour of other traffic (vehicles, pedestrians, animals) and traffic lights, to define auditive or visual feedback, to communicate with other applications, to define the data to store and sample frequency, etc. driver behaviour modeling studies: individual differences in car following, lateral control performance, speed choice, risk taking etc. effects of infrastructural modifications on driving behaviour, effects of road layout, road signs, information displays etc. Car simulators are particularly known for their use in driver training, police training, and also for their application in DUI simulation and demonstrating the effects of driver distraction. However, a car simulator can be also be succesfully applied in a number of clinical applications, especially fear of driving, evaluation of fitness to drive and rehabilitation in a clinic. Methods and techniques based on Virtual Reality are applied worldwide to treat fear effectively, for example hosophobia, fear of spiders, etc. The advantage of simulators, and virtual reality in general, consists of the opportunities it provides to practice in a safe environment while the stimuli that evoke the fear response are presented in a controlled way. People are exposed to the fear-inducing stimuli, a technique also referred to as exposure therapy. This is probably the most effective technique from behavioural therapy to treat specific fears, such as driving phobia. Driving in a car simulator will initially be frightening for people with fear of driving, but after some time of driving, fear will typically reduce. Fitness to drive for older drivers and drivers with neurological disorders, after CVA or sleep disorders is typically done by general practitioners using paper and pencil tests, blood samples and eye measurements. However, a car simulator can make the fitness to drive test more ecologically valid: it resembles the driving tasks and testing can be done in a structured environment with the same test for all clients. Also, drivers assessments may take place on the road in an actual car, The problem with that is that traffic situations and task complexity may vary which makes the tests different between different persons, instructors making the assessment and different times of day, etc. Carnetsoft offers a number of tests for the assessment of driver fitness and a number of simulations for the treatment of fear of driving. Training simulators were first used in the military training sector where they are used to teach aircraft-,ship-, tank- and landvehicle control. Simulators are also heavily used in space travel, and NASA has a complete simulation department for training astronauts. Simulators are used by Universities and research institutes to study the effects of road infrastructure and in-vehicle-devices on driver behaviour, see for example the driving simulator of VTI in Sweden. The biggest and most expensive research driving simulator in the world is located in Iowa. One of the best known applications of training simulator is ofcourse in pilot training for aircraft. Simulation systems have been applied for a longer time in driver behaviour research and the car industry, but are increasingly being used for driver education. Since the year 2000 driver education car simulators are increasingly being used by larger driving schools in a number of countries. The price of hardware has been reduced since then which resulted in some increased use in other countries as well, for example, South Africa, The Emirates, Japan and the United States. The use of car simulator systems has increasing in a number of countries, expecially by driving schools that focus on high standards.However, since the driver training industry is fairly conservative and not very technology-driven, there is still a lot of progress to be made. Also, driver training in a car is relatively cheap, so the cost benefits of using a driving simulator for driver training are more limited compared to learning to fly an aircraft. However, because driver training on the road has a number of distinct disadvantages, learning to drive in a car simulator is better in terms of training efficiency.